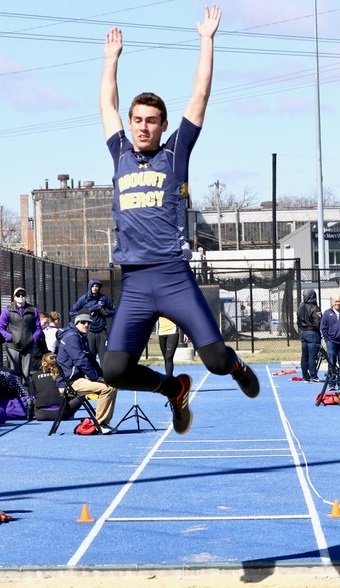 Kathryn Vander Poel and Luke Nickelson were double-champions for Mount Mercy at the Mustang Open track meet Saturday at the Plaster Athletic Complex. Vander Poel captured the 800 and 1500 meter runs for Mount Mercy. Nickelson claimed the high jump and long jump for the Mustangs. Vanessa Cortes won the 5000 meter run, McKenna Johnson took the 3000 meter steeplechase and Jon Anderson won the 5000 meter walk. The Mount Mercy women's track team finished a tight second in the team standings behind Gustavus Adolphus, 114 to 107. The Mount Mercy men placed fourth. Fourteen teams competed in both divisions. 1. Gustavus Adolphus 114, 2. Mount Merecy 107, 3. Clarke 92, 4. Upper Iowa 89, 5. Graceland 74, 6. Buena Vista 71, 7. Hawkeye CC 59, 8. Luther 55, 9. Grinnell 51, 10. Coe 46, 11. Cornell 38, 12. Iowa Club 17, 13. (tie) Knox 5, Northwestern (Minn.) 5. 1. Gustavus Adolphus 145, 2. Hawkeye CC 121.5, 3. Clarke 90, 4. Mount Mercy 87, 5. Buena Vista 66, 6. Luther 62.5, 7. Coe 53, 8. Graceland 46, 9. Northwestern (Minn.) 30, 10. Grinnell 26, 11. Cornell 23, 12. Faith Baptist 15, 13. Knox 14, 14. Iowa Club 5.